I don't have cancer....yet. Cancer is in my family though. My grandma, mom and older sister all had it. My two best friends lost their daughters to cancer. Locally, we have the opportunity to support cancer research with the Relay For Life. You can even donate through this website. And if you get a letter in the mail asking for donations to support a runner in the Team in Training marathons, give generously. Cancer is an enemy waiting to take your loved ones from you and it must be stopped. Support continued research with all your might. The life you save may be your own! 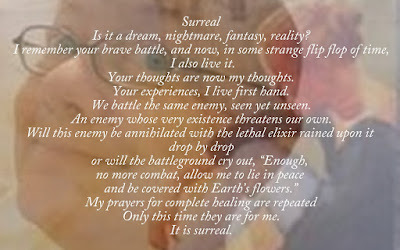 This is a little poem I made up for my friend who is "traveling the path". 10 years ago tomorrow, she lost her oldest daughter, Amber, to cancer. Since then, she has written a book and supported cancer research by running marathons, donations of time and money, helping with Daffodil Days and many other Cancer related activities. You can find her blog HERE. Hop on over and leave her some words of encouragement. I love you Janine! You really are my BEST friend!